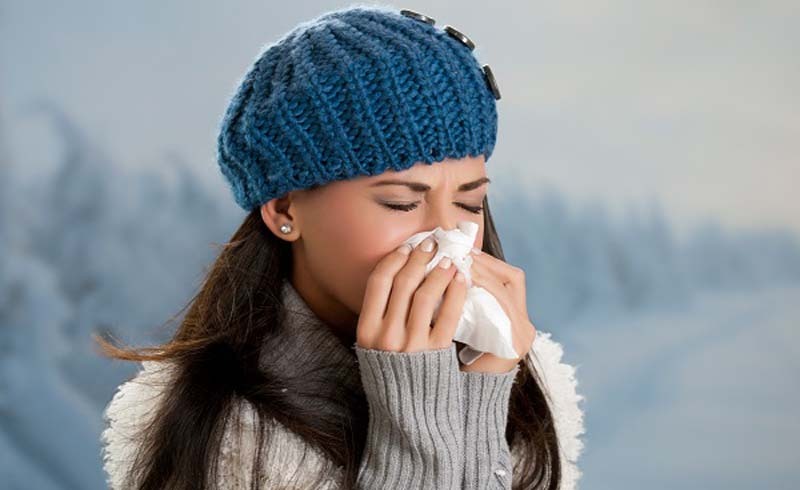 How to avoid getting sick so you can make the most of the season. It's easy to romanticize winter — the first snow, snuggly sweaters and roaring fires, etc. etc. — but the reality of the season, for many of us, involves congestion, chapped lips and exceedingly low energy levels. Not exactly our idea of a good time. But you don't have to sit back and let runny noses and head colds get you down. With these seven easy stay-healthy tips you'll be singing a totally different tune this season. Getting enough sleep — seven or more hours — is essential in keeping the common cold and the flu at bay. Not only will it help boost your immune system, it'll leave you feeling better prepared to face the day (and maybe even ready to take on that early morning spin class). Create a relaxing routine to help you ease into sleep (and boost the brain's production of melatonin) by ditching the electronics at least 30 minutes before bedtime and filling that time instead with a soak in the bath, calming music or a good book. Like getting enough shuteye, staying hydrated is important for feeling your best. Water is essential for keeping your cells, tissues and organs going, plus it helps regulate bodily functions and temperature — it's kind of a big deal. Because we lose water throughout the day through breathing, digestion and perspiration, it's important to replenish the system both my drinking fluids and eating foods that contain water. Staying hydrated will help keep your body in top form and ready to fight infection if needed. Crawling out of bed to get that workout in when the temps are in the teens and it's still dark outside is tough — we get it. But maintaining your fitness routine throughout the winter is extremely important. Besides elevating your brain's level of serotonin, regular exercise can give your immune system a leg up. What's not to love? Make a commitment to move at least 30 minutes a day, whether it be a walk with a coworker at lunch, an early morning vinyasa class or a HIIT workout at the gym. And no need to go overboard: Surpassing your limits and exercising too strenuously can actually have a negative impact on your immune system (you can thank that little stress hormone called cortisol) Need an extra nudge? Buddy up with a friend or coworker to hold you accountable. Now, more than ever, is the time to get your nutrition into gear. Say sayonara to processed foods and nourish your body with warming, whole foods jam-packed with nutrients and good-for-you (and identifiable) ingredients. Load up on seasonal produce like potatoes, kale, squash and citrus fruits — all of which are loaded with vitamin C, which will help keep your immune system strong. Struggling to get in your five a day? Add a morning smoothie or juice into the mix, sticking with a ratio of two parts vegetables to one part fruit. This one goes without saying, but it's effective. And in addition to washing your hands after leaving the restroom, you should be doing it before and after eating, handling money, using public transit, etc. Take steps to take your work space clean too, by sanitizing your keyboard, phone, cellphone and desk daily. On the home front, don't forget to give light switches and doorknobs a quick spritz of sanitizer — they're major germ magnets. Diet, exercise and sleep aren't the only strategies that exist to help you stay healthy. Hang sessions with friends and family are effective too, reducing your stress levels and keeping your immune system on top of its game. Make a point of getting together with your crew at least once a week, whether it's a quick coffee date, stroll through the park or gallery hopping with your S.O. It might not be a balmy 75 degrees, but a quick stint outdoors will do your body good. Vitamin D levels take a hit during the winter, which can affects the way your body absorbs nutrients, your mood and even your skin. Weather permitting, try to spend at least 30 minutes outdoors during the day to soak up a little sun and fresh air. It's as easy as taking a quick stroll around the block. Vitamin D levels still taking a hit? Consider adding a supplement to your health and wellness routine.